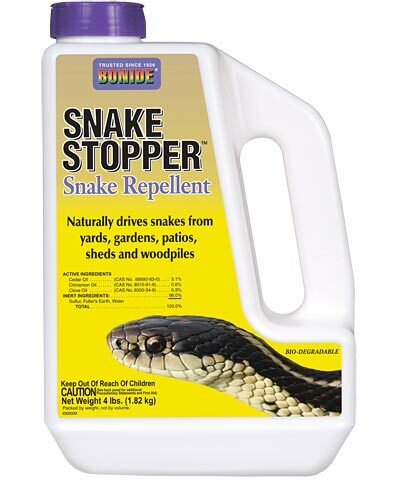 Bonide Snake Stopper Snake Repellent, 4 lbs. Naturally drive snakes from your yard or garden with Bonide Snake Stopper Snake Repellent. This biodegradable product may be used near your home, garden, patio, shed, woodpile, or anywhere snakes are a problem. When used as directed, Snake Stopper is safe for children and pets, and will not harm lawns, gardens, flowerbeds, or desirable plants. Snake Stopper does not harm snakes but repels them naturally by emitting an unpleasant scent and taste which triggers a natural reaction of snakes to escape and avoid. Simply sprinkle a 6-8 inch wide band around the area you wish to protect and reapply as necessary to obtain best results. Keep snakes out of your garden or flower bed with Bonide Snake Stopper Snake Repellent. Bonide Snake Stopper Snake Repellent, Ready-to-Spray, 32 oz.